The hotel is very clean and set in a beautiful and quiet location.Although it is advertised by first choice for families, there is absolutely nothing for children to do and they are "told off" when playing in the pool if they splash.this made them reluctant to enter the pool which was quite stressful.the hotel is run by 2 brothers, one of which is extremely unfriendly and quite rude and the other one speaks when spoken to, something which we have never experienced anywhere in Greece before. Breakfast was very basic continental breakfast with the cheapest brands of ham and cheese and undrinkable coffee.food purchased during the day from the menu however was very good.Rooms are quite small and certainly not big enough for the camp beds that are put in for children.So uncomfortable as well that we put mattresses on the floor instead!There are posters everywhere with rules on them, which in most cases were unecessary.I was shouted at across the breakfast room, in front of other diners,for taking my coffee to the outside dining tables as this was a breach of the rule!It was our first morning and the dining room was really hot and all the inside tables were taken.The hotel is set in a perfect location and on the whole is lovely.if it wasn't for the attitutude of the 2 men that run it and their intolerance of children, it would be fantastic!Wpuld not recomend this hotel for families at all and will definately not return. Prefer a more welcoming hotelier in future. We stayed at the Panorama in August after reading excellent reviews about it. However we were very disappointed. We were not given the rooms we requested and when we asked for a room nearer to our childen's room we were rudely spoken to by one of the sons who stated that our children were old enough to be in a room on their own and that the hotel was full. One of our rooms had a view of a stone wall. It is a shame that one of the sons treats guests in this manner. Otherwise the hotel itself is fine, in a good location and clean but totally marred by the attitude of this person! Set in a good location of Lesbos. We found the hotel very clean, and the pool area was excellent. the food was OK not alot of choice, we had the same breakfast offered to us for the whole week. Although we can not fault the hotel itself, we were very disappointed to find ourselves put in a room with a view of a garage to the front and a brick wall to the side, when there were other rooms available, and we had specifically booked a room with a view. The Panorama Hotel in Petra is family-run and located about 500 metres from the village of Petra. There is a pavement alongside the beach so walking into Petra is safe. The hotel is situated off the main road along a track. The first thing that struck us about this hotel was the cleanliness in all areas. It was absolutely spotless, especially the pool itself. The hotel is built up a hillside which does give fantastic views over Petra and the sea, but if you are in one of the higher rooms, you may find it hard work going up and down. In our opinion, it was worth the walk up and down several times a day for the view and if we went again, we would definitely request a high-up room. bread, jams, cheese, meats, cereal, tea, coffee, juices - and the most marvellous Greek yoghurt which was so thick that you had difficulty in getting it off the spoon. We had a couple of lunches (Greek Salad, tuna salad etc) and they were good. We didn't eat any evening meals in the hotel or go to the weekly BBQ, so we can't really comment on the quality of entertainment. The rooms were spacious enough (ours had 3 beds in, with 2 singles pushed together) with fridge (if you want to use this you pay 3 Euros per day), masses of wardrobe/drawer space, a safety deposit box (at a charge of 6 Euros per week), TV and a balcony. The furniture was polished pine. Air conditioning is also available at a supplement. I don't know if our room had just been redecorated but again, it was spotless. None of the usual marks of dead mozzies on the walls! The bathroom was also very clean with nice tiles and a ceramic shower tray and CLEAN shower curtain (I hate those yucky, mucky shower curtains). The 2 sons generally looked after the bar & meals and were very pleasant. The Reception area was lovely, with high ceilings, marble floors and lots of really comfy sofas, and a big TV (we were there for the first part of the World Cup). There was a very well stocked library and access to the Internet (not sure about the charge for that as we didn't use it). The pool was quite large, 3 metres at the deep end. There were lots of sunbeds with a few big umbrellas and running down one length and along one width of the pool was a veranda that provided shade. We would definitely choose to revisit this Hotel. if you'll be walking up and down from your room, leave your high heels at home. They will be totally impractical on the paths between some of the higher rooms and reception. The path into Petra is quite uneven too, and I wouldn't have wished to negotiate this with heels or even wedges on. Breakfast is poor- cheap cereal - no toast and hard boiled eggs once a week if you are lucky! Apart from that minor problem the only other fault is one of the sons- one minor problem and all hell breaks loose, no manners he lets the family and hotel down. That aside the hotel setting is perfect. The pool is wonderful it almost feels like your own private pool. We had a wonderfull time again in Petra at the Panorama hotel the rooms were cleaned to a high standard. Food was fair at lunch times,The pool area was excellent. Our room was at the top of the hill a bit of a trek but well worth the view. Panorama Hotel is a nice place to stay with great views (if your in one of the rooms up the hill). Our room was up the hill and we had great views of the bay, resort and sunsets every evening! The hotel was very clean throughout with maid service 6 days a week. The food was ok. Breakfast consisted of bread, cheese, meat, jams and Greek yoghurt (yuk!). You could have fruit juice and tea, coffee to drink. Not a great selection for lunch's but the one's we had were very nice. Evening meals were available. The hotel is located across the road from the beach and away from all the sunbeds and parasols and a 10 - 15 minute stroll into resort centre. The hotel is family run. Dad who is Greek, Mum who is Australian and 2 sons. 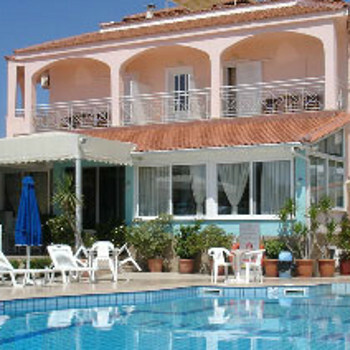 Pool area is very nice with very comfortable sunbeds and a larger than average pool. There is also a veranda type of thing at the back and down one side of the pool area where you can still lay on sunbeds, but be in the shade. There is also a BBQ every Friday night. The only downside was the hike up to our room, but it was worth it for the views we had! Would i go back? Yes, but in few years time.